A very useful item will be added to MCPE using which you can realistically get rid of unnecessary things. A trash can is an attribute of any house and why do not you get this item for your mansion? In addition to the stylized texture, the trashcan actually contain various rubbish and, most importantly, remove it. How does the trashcan work? First place it (trashcan icon in your inventory or a creeper spawn egg). Then open it: put everything in it that you no longer need and you want to remove once and for all. Sneak and empty your trashcan by tap. Do not miss the opportunity to decorate your house with new items of everyday life. 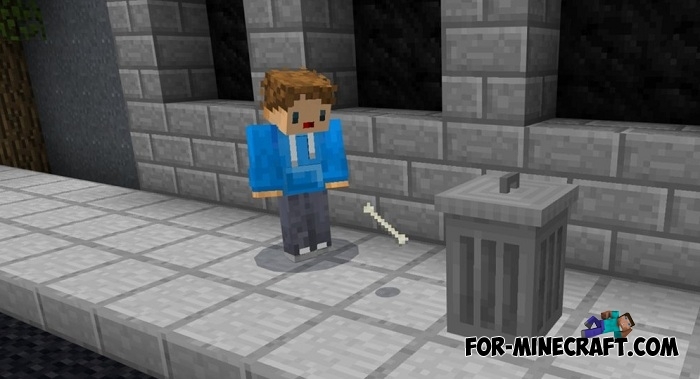 The FurniCraft addon adds the main furniture that is simply necessary for any living space, and Working TV will present you with an animated TV in Minecraft Pocket Edition. How to install the Trashcan addon?